Hors d’oeuvres & beverages, including beer/wine will be provided (Valid ID required). A special tribute in memory of Caballo Blanco, mythic hero of Born To Run, will be given by Luis Escobar, his close friend and a renowned ultra-marathoner. 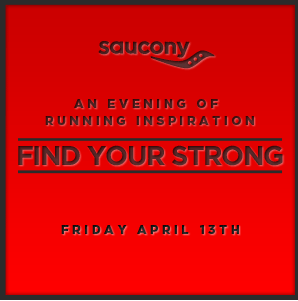 Runners are invited to try Saucony’s award-winning line of footwear; coaches and treadmills available for one-on-one coaching. 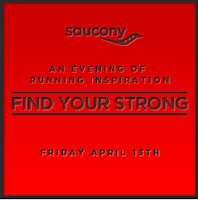 0 Response to "Saucony Presents: Find Your Strong! - 4/13"